I adore The Cake Boutique and The Sweet Stylist – each of them on their own are truly scrumptious. Melissa Woodland from The Cake Boutique creates some of the most delicious cakes around with an astonishing array of mouth watering flavours and brilliant design skills. Laura Atkinson on the other hand owner of The Sweet Stylist not only has all my favourite old retro sweets (yes a tub of White Chocolate Mice is my absolute dream), teamed together with her beautiful glassware and venue decorating skills, she creates stunning displays to wow your guests. 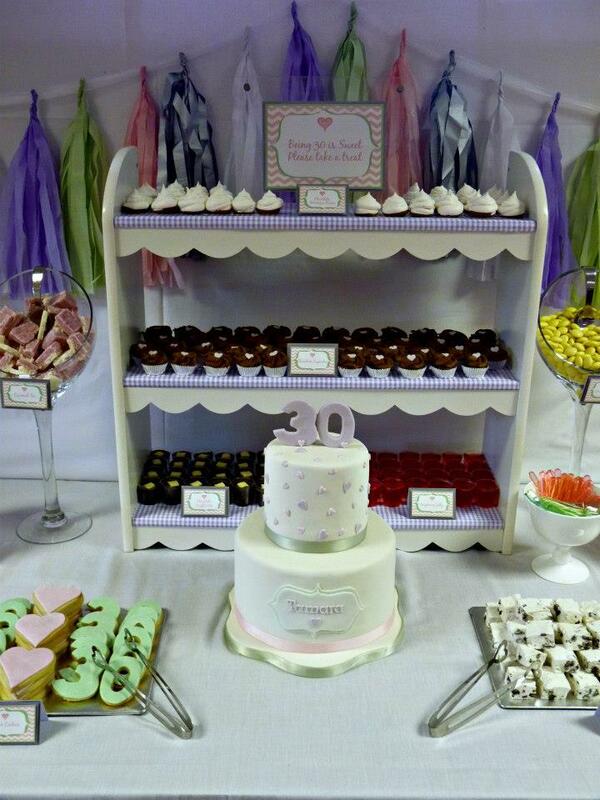 “Melissa and I created this stunning Sweet Dessert Table, for a very special 30th Birthday Party. We not only supply delicious treats and confectionery with our Sweet Dessert Tables, we style them to help bring our customers ‘Sweet Wishes’ to life. 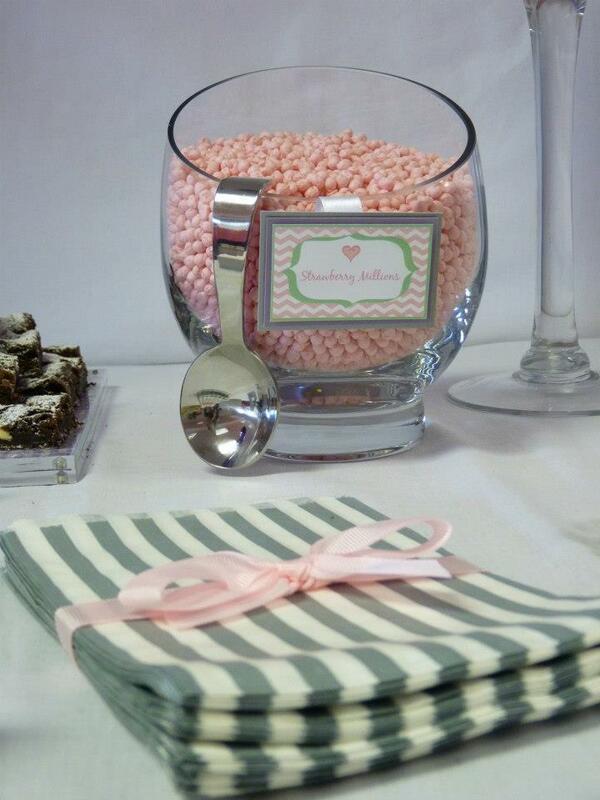 Our brief from this client was to design a Sweet Dessert Table that was both elegant and girly, using pastel shades. I designed the paperie, layering different pastel shades and using a classic plaque shape to keep an elegant feel throughout. This design was mirrored onto a truly spectacular two tier cake to compliment the theme. Melissa designed the cake in a clean and elegant style, with stunning pastel detailing. Melissa made tiny chocolate cupcakes, gourmet cookies and cream marshmallows, chocolate dipped meringues, blondies and brownies, chocolate truffle pots and sparkling raspberry jellies. Because of the size of the party, we displayed the cupcakes, meringues, jellies and chocolate pots on a pretty white shelf, covered in a lovely lilac gingham print. This added a wonderful focal point to the table, yet keeping the truly girly feel. The confectionery was displayed in open slanted vases to help show off the beautiful pastel shades of the strawberry millions, coconut ice, chocolate pebbles and strawberry bon bons. So that leaves us with one final question… Which is your favourite treat – Sweets or Cake? Let us know in the comments box below! If you would like more information on what these lovely ladies can create for your special occasion contact them using the details below.